Landscape lighting offers lots of great benefits for homeowners. If you’ve installed landscape lighting on your property, statistics show that your family is more secure, and that your home is less likely to be a target of criminal activity. Your family and your nighttime visitors are safer, too, from accidental mishaps, thanks to well-lit walkways, pathways and driveways. And the aesthetic benefits of landscape lighting are obvious. But installing landscape lighting on your property will yield another great perk that’s often overlooked: it will increase the property value of your home. You might expect that landscape lighting will increase the value of your property because of the cost of the installation: labor, equipment, etc. And that’s certainly true. But the benefits do not end there. Realtors will tell you that professionally installed landscape lighting adds real value to a property, AND makes it easier to sell. It’s not just a dollars and cents issue. 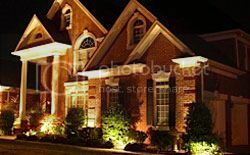 New York realtor Michael Burke states on his website that many prospective buyers will first see your home in the dark of evening, when all of the work and money you’ve poured into your landscaping will be hidden in darkness if you don’t have landscape lighting. You may not be planning on selling your home anytime soon. But for most of us, that day eventually comes; it’s rare these days for people to remain in the same home for all their lives. So when you invest in landscape lighting, you get to enjoy the safety, security, and beauty that your system offers, for all the remaining years you spend in your home. And when the time comes to sell, your lighting system will increase the value of your home, and help to sell it faster and easier. Most people would consider that to be a pretty good deal! This entry was posted on Friday, July 5th, 2013	at 9:00 am	. You can follow any responses to this entry through the RSS 2.0	feed. Both comments and pings are currently closed.